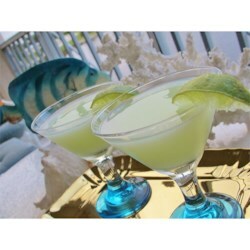 "This is a citrus drink, great for all you lime lovers out there. It is our favorite." In a cocktail shaker full of ice combine vodka, triple sec, fresh lime juice and bottled lime juice. Shake, don't stir and strain into a chilled glass. Watch a professional bartender shake the perfect margarita. It's kind of girly, but easy to handle as a shot. This is a very pleasing and delightful drink. My girlfriend loves this drink the most. But most of all it's not one that requires a lot of practice. Yay! I've found a new drink I love! This is great! We just made these tonight (in January!) but I think they would be very refreshing in the summer heat!